Thinking that I wouldn't be at a loss for inspiration for the January Art Elements theme of the moon, I signed up. It was a good thing I did too because if I hadn't I may not have pushed myself to complete what I did. 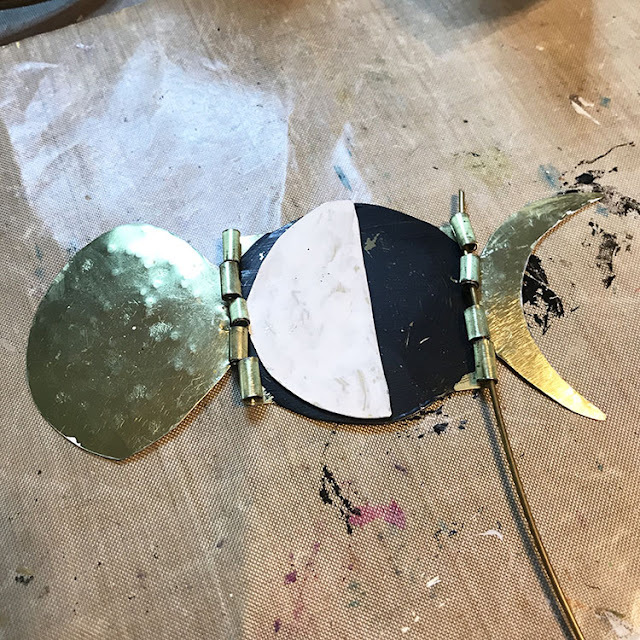 While the opportunities for inspiration from the moon are vast, I initially considered making something similar to the Harvest Moon Earrings I made for Earrings Everyday back in October 2017. But, I have to admit that I didn't put much thought into the project until I was looking for information on the Super Blood Wolf Moon and eclipse that occurred on January 20th. 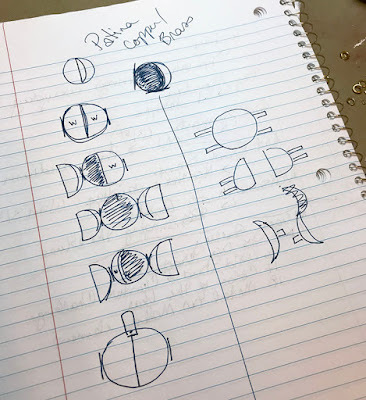 An image of the moon phases struck me, and I was compelled to sketch out an idea. I thought it would be interesting to make a pendant with a hinge that could be flipped to reveal some of the moon's phases. But, my lack of experience in crafting a hinge made me hesitant to begin the project. 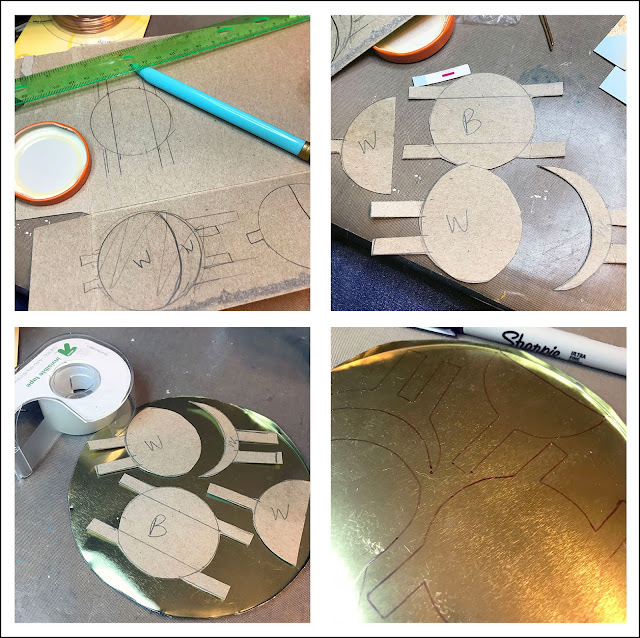 I started by making a template of the phases I wanted to include on a cracker box, cutting out the templates, taping them to a piece of brassy-colored tin, and tracing them with a fine tip marker. The idea swirled in my head for far too long, and I was finally so pressed for time to complete the challenge that I'm sharing my first and only attempt. I believe more practice would have lead to better results. In the end, this pendant functions successfully but is not the expertly crafted pendant that I had initially envisioned. However, I'm pleased that I was able to make the hinge work. The shapes were cut with tin snips, filed and distressed, and then colored with Vintaj Patinas before being sealed. My failures are in the actual shapes and the cutting of them. Thankfully, I had just purchased some new tin snips that made cutting out the shapes a little easier, though not exact. Not only did I have to snip down the tabs, but also the circular shapes to get the rolled tabs to fit within one another securely. I also added jump rings between some of the tabs so that the moon phases weren't hanging too low. 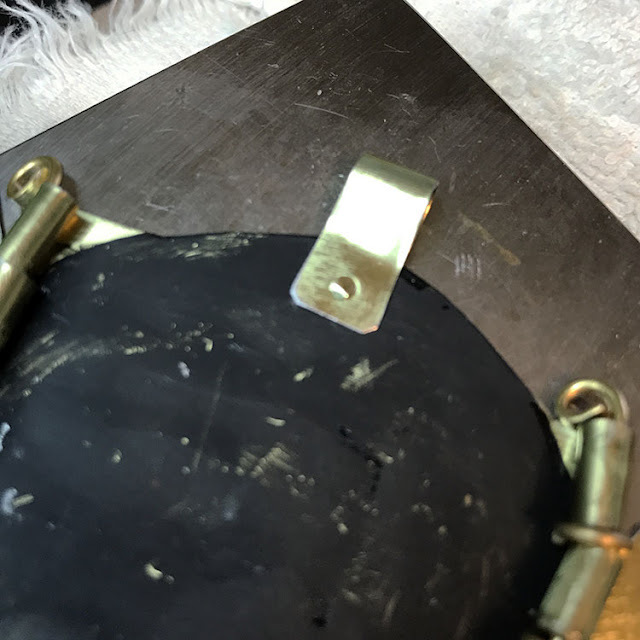 For the hinge pins, I used heavy gauge brass wire that I turned into loops to keep them from slipping out. 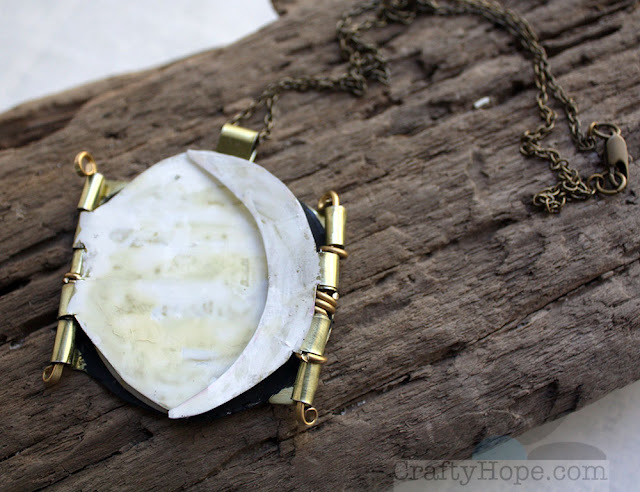 A piece of the excess tin was used to create a bail by riveting it to the back of the pendant. Like the moon, this pendant was difficult to photograph. Here's a look at each of the phases I was able to create. 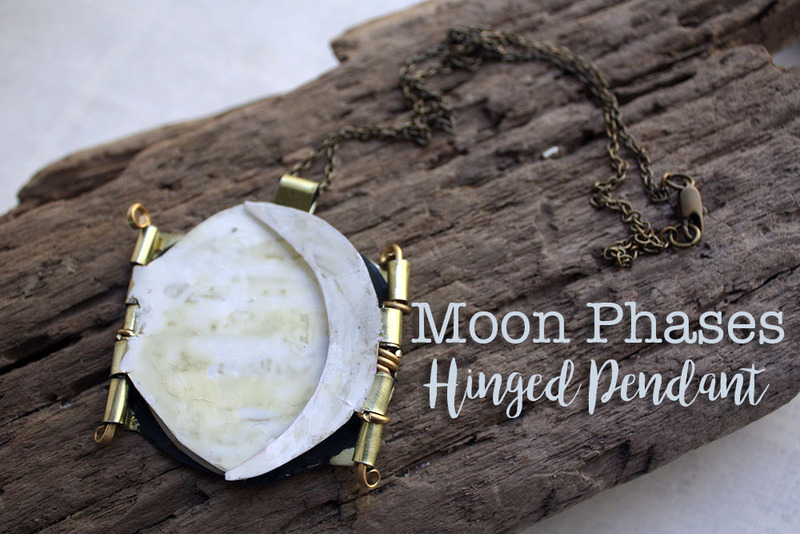 So that you could see the Moon Phases Hinged Pendant in action, I also created a quick video. But, here's another few looks at it in its entirety. The discoloration on the patina was caused when I used a matte nail polish top coat to seal the color more securely on the tin. However, I dig that it echoes the color variations on the real moon. Now that I've actually attempted creating a hinge and know where some of the faults lie in my process, I'm less scared to try it again. Thanks go out to Lindsay for offering up a theme that left the door open for loads of interpretation. And, I'm sure that you'll see plenty of them from the other artists that participated in the challenge. Make sure to hop around and check them out. Finally, if you have any tips on making hinges, I would love to hear them. I'm also linking this post up at the following link parties: Handmade Hangout, Saturday Sparks, Saturday Sharefest, and Mad in Crafts. I think that it is a fabulous idea and makes me wonder why I never thought of it before. I have seen that white patina ink works better when you apply a layer of gesso on the surface of the metal. Still like you rightly pointed out, the moons is more gray and beige than white so in that regard it fits well. Thanks! Now that I know I can actually engineer a hinge, it's a matter of putting on some better, more finessed touches in the future. I hate to have come forward with this contribution, but I let my trepidation get the better of me. I've gotten over that hump now and can more forward. I'll never make progress if I don't try, right? 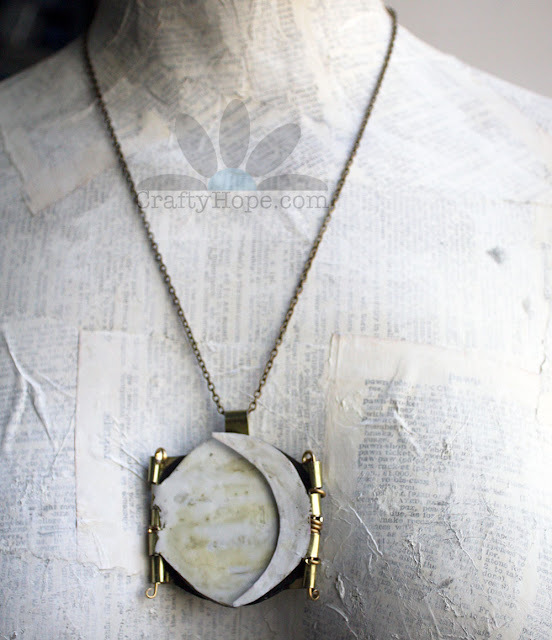 Wow - I love the idea of the pendant with the different phases of the moon. 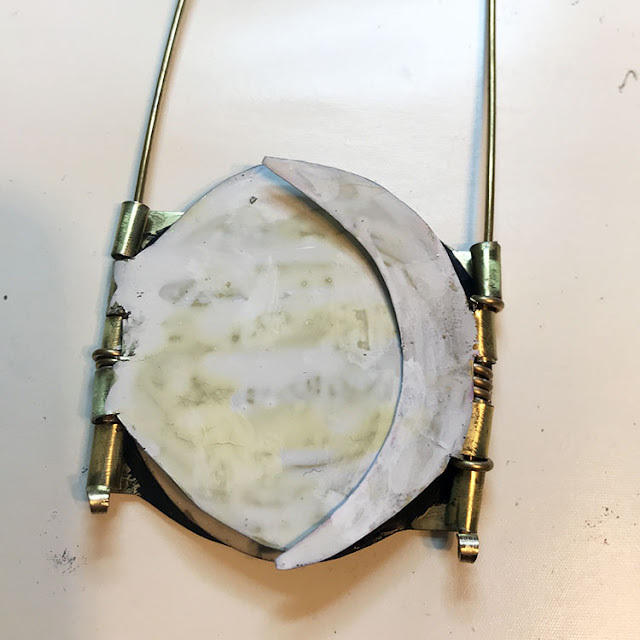 I also liked seeing the process of how you created the pendant. It may not be perfect, but I think it is gorgeous! That's a very cool design idea, well done! Cat, Thanks so much! It was rough going, but worth it for what I ended up learning from the process. I appreciate you hopping by!! This is a fantastic idea, and a solid first attempt - very creative of you! Anita, Thank you! I'm glad I went with the tin for this first attempt. I was actually considering using up some of my brass and copper sheets for the design, but decided to try it on tin first to work out the fiddly bits. I'm relieved that that's exactly what I did and ended up not wasting my "good" metal. Ha! Thanks for your encouragement. Oh wow, Hope, so great that you tried to do the hinge! Thanks for showing your process, and what a great idea! And yes, the mistake of the nail polish actually does make it look more moon like! Well done! Looks like you ended up learning a lot along the way just as I did. I am such a perfectionist that it is amazing I even did what I did. As you hinted at, it does take courage to try something out of your comfort zone. I am amazed at the wonderful results of your attempt. The necklace is very cool! Well done Hope. So creative!!! I was just admiring the crescent moon this morning. Amazing! I love the concept and design process. I have faith that you will definitely master this. 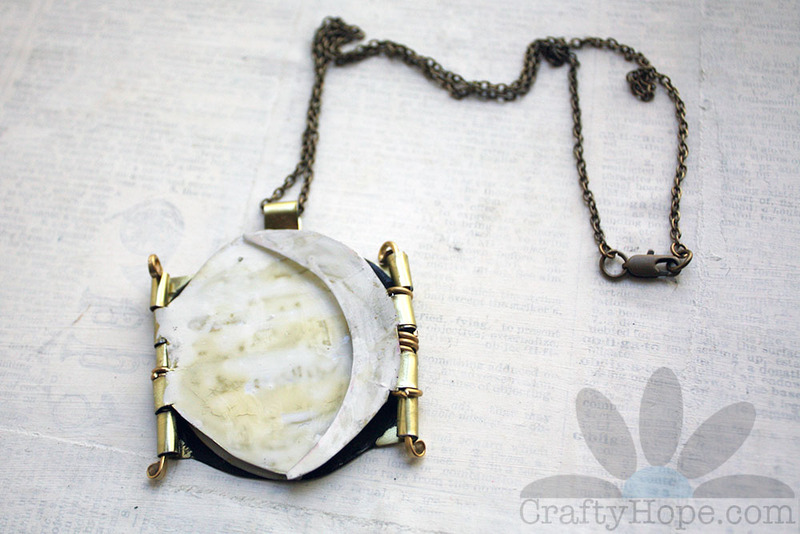 I think it's a fabulous piece for your first hinged design. Thank you! I definitely think I was a tad ambitious with the shape and number of layers for my first try. Next time (and there will be, I think! ), I'm going to scale it back and go with a shape more conducive for a hinge (like a square or rectangle!) I'm already tossing around an idea. Thank you for you encouragement and belief in me. Onward and upward! What a brilliant design! Thanks for sharing how you engineered it, I really enjoyed reading about your process. Caroline, Thanks so very much. It was a trial for sure and nothing compared to the engineering that I'm sure goes into your automata. I do appreciate your kind words more than you know. Again, thank you. PS: Love, love, love the short video as well! What an utterly intriguing necklace, I LOVE jewellery that moves and this is just wonderful! Niky, Thank you! I like jewelry you can fidget/play with also. And, I'll be playing with this idea for a while. I appreciate your support and kindness! Thanks again! Ok. That's pretty awesome. The finished piece is pretty darn cool, but I love that you stretched yourself to try something new and even made a video to show us how it looks in action. LOVE IT. Thanks so much for sharing this with us, reading AE, and for participating in the challenge. I hope to see you participating in future challenges too. You are too sweet! I'll definitely be playing along for more challenges BECAUSE they stretch me to try something new. And, it's so great to be included in a list of amazing artists like yourself. Thank you for taking the time to hop over, read, see, and watch! Hope, I'm glad you decided to venture into new terrain and that's what the challenge is all about ... well, for me they are. And you shared your mishaps, which is brave! I think you have a great idea going there and would love to see your perfected, finished piece one day. I'd just scour YouTube vids and blogs about hinges and I'm sure loads will pop up. Alysen. Alysen, Yes, I think I am going to do some studying up now that I have a little more luxury of time to learn about the subject. Hopefully I'm not determined to make one in February! Ha! Thanks for checking it out. I really appreciate it. What a spectacular idea. This is so creative and although you, as its creator, can focus on its flaws, I proclaim it a grand success as a proof of concept. Now that you've made your prototype, I hope you'll visit this idea again because it really is fantastic. Tammy, A Grand Success? Sounds so lofty. I do hope to try again with better materials and a more thought out design. In fact, I've already got one idea sketched out. Now to just work out the kinks! Thanks for the support and encouragement. It means so much to me. I really appreciate that you truly challenged yourself and your skills! This is what our challenges are all about! I love this whole idea - and that you jumped right off into the deep end of the mysteries of metalwork (at least it's mysterious to me!). I definitely would have been too scared and would have ended up with a bunch of scrap in the trash, reaching for my nice safe needle and thread. Bravo! Please continue to play along with us, I am really looking forward to reading about the next challenge you set for yourself! Lindsay, I'm working to push myself this year as I'm learning that you have to do what scares you if you ever want to progress and grow. I hope to join in the next challenge for sure. I just need to make it a priority rather than waiting for ideas to marinate all month! Thanks for the kind words and a great challenge! Hope, I think this is an unique idea and so ingeniously structured! I'm in awe, all the more so because of its complexity and technical work involved! Fantastic job! Hope - that is very cool! The tin makes sense as the hinges roll well... how thick was the sheet? Some tin I have had was so reading sharp.... Robert Dancik has some tuts on hinges on Craftcast too. This is making ideas ping in my brain! Thank you for sharing. And the video was awesome. Yay! So glad you like this. I have to admit that the tin was VERY thin, possibly in the 24-26 gauge range. I had hoped to make it out of copper or brass once I got the design right, but time just wasn't on my side. As such, my poor crescent moon already had some bending issues. But, the necklace as it is is just for me. Thanks for the tutorial recommendations. I'll have to look those up! So glad I inspired you. That's kinda the point of these things anyway isn't it? Ha! Thanks for hopping by and taking a look! Hope, that's a really cool idea! Good for you for pushing through and giving that hinge a try. It was cool reading about your process and how you put the whole thing together. Such a creative and unique pendant! Sarajo, Thank you!! It was a bit of a struggle, especially rushing as I was, but I am indeed glad that I pushed myself to make something I could learn from. Thanks for taking the time to hop by! Wow!! That is some stunning work!! I love how you were able to execute a complex design and work out each piece. It's such an original idea and I think it came out beautifully. You should be very proud! Sarah, Aw, thank you so much. I'm proud that I was able to get it to work, in concept. The idea needs tweaks, but I suppose that's true for anything you try the first time. Thanks for the support! I am still completely impressed!!! They always say, "practice makes perfect" yeah? In any event, I love your first attempt and love that you're always trying to learn new things!!! This is such a beautiful piece of jewelry. My daughter who is obsessed with the moon would love it. Rebecca, Thank you so much!!! :D No worries about being "late", that's what's great about the internet...it's ALWAYS here! Ha.